This column first appeared on EducationNC on August 9, 2018. If, as a teacher who sees success with one class of students, I could reach twice as many students per class, why shouldn’t I try? That’s the question I asked myself in trying to solve a dilemma my middle school science students faced. In the end, it wasn’t quite that simple — but the lessons we learned will continue to benefit students. In the 2015–16 school year, Cabarrus County Schools introduced earth and environmental science to advanced middle school students, bringing it down from ninth grade to eighth grade. As a teacher at Harris Road Middle School, I quickly saw that this meant students would have to learn two years of science in one year. Although the curricula were meant to overlap, in reality, they overlapped very little. As the year progressed, I discovered that students simply did not have time to do hands-on labs while also incorporating the global problem-based learning that we are required to provide — something meant to increase students’ knowledge of the world. I found it unacceptable to teach science without hands-on labs. Having seen a math teacher use blended learning to reach more students, I was intrigued by the prospect that this could solve the lab time shortage problem. In math, students were with the teacher on day one, with an assistant monitoring their online learning on day two, back with the teacher on day three, and so on. This allowed the teacher to cover two full sections in one class period. So I approached my principal with an idea: Use the blended-learning teacher-reach model so that I could teach a group of seventh-grade advanced science in the same class period as my eighth-grade earth and environmental students. Then, I could bring some of the eighth-grade content into seventh grade, lightening the load for the next year. For example, I could add the weather content to the already-scheduled nine weeks on weather in seventh grade, and bring the eighth-grade molecular biology unit in, as the seventh-grade curriculum already incorporated a cells unit, human body unit, and genetics unit. By adding the time with an assistant, students could now learn some material online, with materials I created, freeing my time with them for more labs. My principal thought long and hard about it, but in the end, he gave his go-ahead for the following school year. With my additional classes — two each of advanced seventh-grade science and earth and environmental science — I had a total of 250 students. I spent the summer creating the content for both courses, using planning time paid for by my district. Focusing on pace and standards, I put all the material into Canvas, an online learning management system that would give students access to the content any time, anywhere. In the beginning, I kept wondering “what have I done to myself?” as I would go home exhausted at night, still needing to prepare for the next day. Since I developed the digital content, I really didn’t expect a lot of prep through the school year. However, a teacher must adjust for each year’s students, and my district did not incorporate extra planning time for blended-learning teachers that year. I soon discovered my seventh-graders were not ready for independent digital content. Lacking the maturity at first to be successful, they needed to be direct-taught and to slowly incorporate the independent, online learning. For the first half of the year, students found it hard to make the switch between my teaching and their work with the assistant — if we said the same thing in different ways, students believed we were telling them two totally different things. They needed the maturity and many critical thinking activities to grasp this and be able, by the end of the year, to work well using the blended-learning model. The payoff came the next year, when those students moved up to the eighth-grade earth and environmental science class. They retained much of what they learned in seventh grade, and they had the maturity to start working on day one in the blended model. That showed in student learning growth scores — students in seventh grade met growth expectations, while in eighth grade, they exceeded expected growth for both the eighth-grade information and the earth and environmental instruction. I believe the difference was their maturity level, and the ability of the older students to be ready to work more at their own pace. I especially saw that maturity change during lab time — in seventh grade, students felt labs were play time instead of a learning opportunity. Throughout the year, I was able to witness changes in their attitudes during labs and in their self-motivation to complete work online. Unfortunately, after a lot of discussion and debate, the school administration decided to end the blended model for the advanced seventh-graders, instead having all students take the same regular science class. I agreed with the decision; seventh grade for most students is all about change, and another advanced class was adding a lot of stress to most students’ already-packed schedule. But we’ll take the lessons we learned further into eighth grade, where I will be extending my reach to six blended earth and environmental classes — exposing many students to the increasingly needed experience of online learning. And I will continue to extend my reach by acting as a mentor to our new seventh-grade science teacher, using the insights gained in my years with both grades. Elizabeth Annette Bartlett is a blended-learning science teacher at Harris Road Middle School in Concord, N.C., where she was the school’s teacher of the year in 2017. 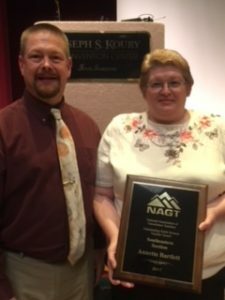 She was named the outstanding earth science teacher for North Carolina in 2017, and went on to be named the eight-state Southeastern region winner.